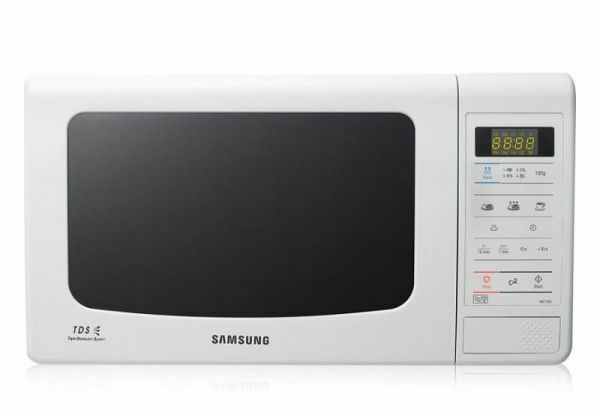 DESCRIPTION:The Samsung ME733K Solo Microwave in an eccentric white and striking metal finish, will fit perfectly into any kitchen. Cook for all the family with this ample 20L capactity. Anti-bacterial interior.Interior capacity 20 litres.25.5cm diameter rotating turntable.Size H28, W49, D32cm.Weight 11.5kg. If you're one of those people who are only comfortable using their microwave to make popcorn, you're not alone. But now our new design will change the way you feel about microwaves. Grab the ergonomic handle and it's just as easy on your grip as it is on the eyes. Gaze through the wide tempered black window and clearly see the progress of whatever you're cooking. Press Tact button & rotate Dial knob to easily and accurately select the pre-set time you want. We've put a lot of thought into this design because man cannot live on popcorn alone. Three Waves are Better Than One. At Samsung, we pride ourselves on improving every product we make with innovative technologies. Our Triple Distribution System ensures that everything from pizza to warm milk comes out perfectly prepared and delicious every time thanks to three microwave distribution points. With our microwave ovens, you’ll enjoy consistently even, thorough cooking. الخدمة محترمة والتوصيل سريع ومجاني! هجرب المنتج نفسه لكن شكله هيكون مرضي جداً!